Periodically, approximately quarterly, we offer a popular adult religious education opportunity known as “pUUb Theology”. 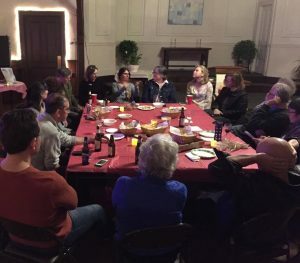 On these Friday nights, we gather in our sanctuary, transformed into a “pub” for the evening (decorated to create some pub-like ambiance), and share snacks, beverages-of-choice, and conversation about things that matter: philosophy, theology, events of the day, and more. These gatherings have been well-attended for the past few years, and lots of fun. It’s a chance to get to know each other better and have a satisfying discussion in a safe, welcoming, low-key environment. Rev. Lara Hoke will offer some topics, or you can suggest topics of your own. Please join us, and bring a friend! pUUb Theology is free. At the UUCiA, 6 Locke Street. Please check our events calendar for specific dates.